Hi Im Master Ivan Rolls, founder of Family Martial Arts Leadership Academies. Ive seen literally thousands of people lives change through our martial arts training over the last 15 years that we have been providing martial arts to people of all ages and abilities in our local communities. We provide unique and inspiring martial arts, fitness, and self defence classes for the entire family and specialise in teaching complete beginners right through to experienced Black Belts. You don't have to be fit to start and your confidence will grow week by week. Our programme is a unique blend of mixed martial arts styles that places a strong emphasis on becoming a multi-skilled, fit and capable martial athlete, whilst prioritising personal development and personal growth above any natural talent. This empowers people to achieve their full potential as we focus on developing the individual student's strengths and helping them overcome their challenges. We make this process so very enjoyable you will love coming back for more. Get started now on your FREE induction and trial and you will see for yourself how we can help you, your child, or your whole family become your best! My daughter Kelsey started at FMA back in October and she is enjoying it 100%. Her confidence and attitude is improving every week plus it is keeping her fit. She has now progressed onto the advanced classes which is pushing he that little bit more and it involves a lot more self-defence training. Master rolls and his staff are excellent and very helpful, I would recommend it to any family who are looking into starting martial arts. My daughter started last year she was very shy and lacked confidence. Over the years She has tried gymnastics dance drama and tennis only lasting a few weeks. Martial arts is the first thing she has ever committed too and she looks forward going every week. Big thank you to Master Rolls for encouraging her to believe in herself, she is now such a happy energetic and strong teenager full of confidence. She has a goal now and wants to become a black belt. Thank you FMA what you have done for her is priceless. My son Cain started in February and he loves it. His confidence and attitude have improved as well as his fitness. We were made to feel really welcome when Cain first started and its lovely to see the children and parents training together. The children are taught not just martial arts techniques but also valuable principles they need such as respect and honesty. Master Rolls and the rest of the staff are excellent and take the time to help when needed. I would recommend this club to anyone who is looking into martial arts. 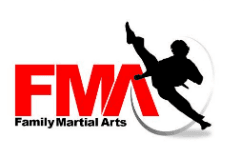 My 13 year old daughter and I joined FMA Warrington nearly 4 months ago as complete novices. We were made to feel so welcome from the first moment we stepped into the school not only by our instructor, Miss Fletcher, but also by the rest of the group, which is a real mix of all ages and sexes. The fact that we were totally new to martial arts has been no obstacle to our enjoyment or progression, thanks to the way in which the classes are run by Miss Fletcher. Bring a heap of commitment and a willingness to learn, leave your ego at the door and you will absolutely love it. We were proud to have both been invited onto the Leadership programme after achieving our first belt after just 2 months of attending class, which we do at least twice a week. I can honestly say that it is one of the best things we have ever done and it's great to do something so positive together as a Dad and daughter. I would have no hesitation at all in recommending FMA Warrington particularly to families. Come down and enjoy martial arts together - you certainly won't regret it! Myself, my Son and Daughter joined FMA Warrington nearly 3 months ago now and it's the best thing we've done. As a parent it's fantastic to see your child/children gain new skills, develop and grow with lifestyle skills and at the same time having the reassurance knowing your children can look after themselves if it's ever needed. The Instructor and other students are so friendly and welcoming and make you feel part of a family. I would highly recommend FMA Warrington to anyone who is thinking of an activity to do with your children, whether its for Mixed Martial Arts, Self Defence, Fitness, Weightloss and a great lifestyle foundation for your kids (Confidence, Disciplne etc.). I have been going for 3 months now and can say that it is truly addictive. I started with the intention of coming a couple of times a week but find myself aiming for 3-4 because it is that good. Miss Fletcher is excellent at teaching what you need. Patient, always positive, always a smile on her face and really good at getting the point across. I can not recommend it enough. I joined only 6 weeks ago after my husband and kids have been going for 3 months. I didn't want to join initially due to how unfit and overweight I was, but I am extremely proud to say I can now keep up with the workouts and have lost a stone in weight � due to all the support I have received in the class. Our teacher and the other students are fantastic, so those ladies who have tried dieting give this a go it truly works. my first lesson. I have been going for 2 months now and try to get there 4 days a week. I find myself really looking forward to attending and being put through my paces so much so I am signing up to the leadership course and will be pursuing my black belt. Miss Fletcher and Miss Whitehead are fantastic, I would recommend this to anyone. David has decided to take the next step and sign up for black belt leader course, he really enjoy's going and for a 6 year old that can't decide is something I didn't think I would hear, thank you FMA..